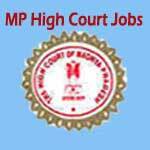 MP High Court Recruitment 2018 – Apply Online for 739 Driver, Peon/Watchman & Other Posts:- High Court of Madhya Pradesh, Jabalpur has issued notification for the recruitment of 739 posts of Driver, Peon/Watchman/ Waterman, Gardener (Mali) & Sweeper. Interested & eligible candidates can apply online through the official website of MP High Court. Online Application Process has started from 01/12/2017 and the last date for submission of online application is 31/12/2017. 1. Driver: 8th Class with Light Motor Vehicle (LMV) Driving License. 2. Peon/ Watchman/ Waterman: 08th class pass from any recognized Board. 3. Gardener (Mali): 08th class pass from any recognized Board. 4. Sweeper: 08th class pass from any recognized Board. Commencement of Online Application : 01/12/2017. How to Apply: Interested & Eligible Candidates can apply online through http://www.mponline.gov.in from 01st Dec 2017 to 31st Dec 2017. Subscribe our Sarkari Naukri Mail Service for MP High Court Recruitment 2018.